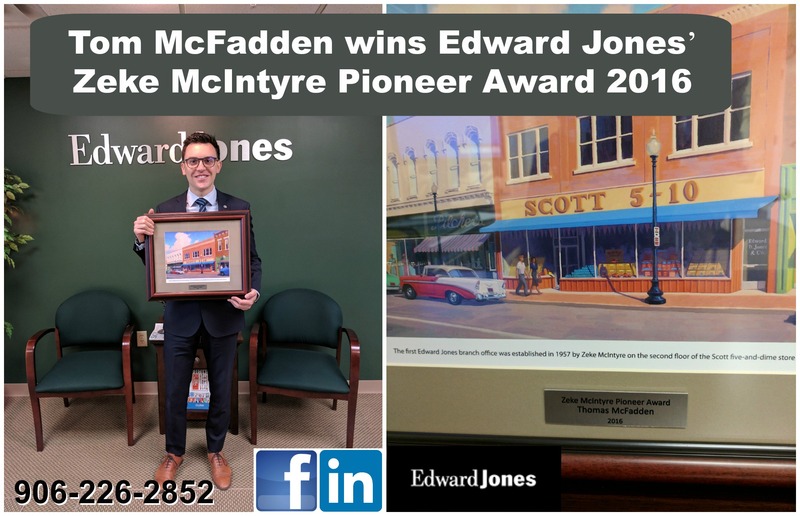 Marquette, MI, 2017-Jul-31 — /EPR Network/ — Tom McFadden of Edward Jones recently won the firm’s coveted Zeke McIntyre Pioneer Award, which recognizes new financial advisors who achieve high levels of success early in their careers with the financial services firm. McFadden was one of only 318 of the firm’s more than 15,000 financial advisors to receive the award. Jim Weddle, the firm’s managing partner, said the award is a strong indicator of a financial advisor’s future success. The award is named after Edward Jones legend Zeke McIntyre, who opened the firm’s first branch office in 1957 in Mexico, Mo.